Lightweight, sturdy, compact, rust free, and durable stainless steel material. Green and Healthy : The travel utensils set is reusable, and much healthier than flimsy plastic cutlery. 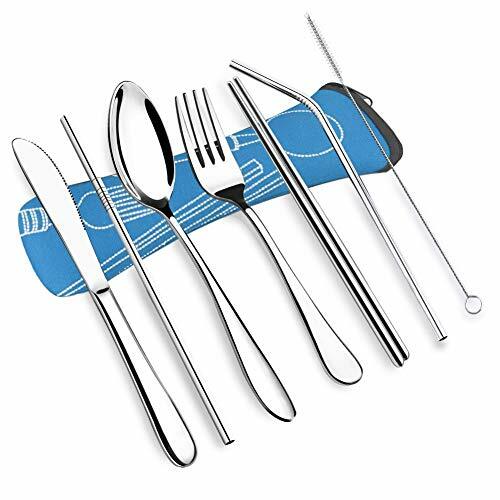 Set of 7pcs utensils with straws and brush(1 fork, 1 knife, 1 spoon, 1 chopsticks, 1 straight straw, 1 bent straw, 1 cleaning brush), perfect metal straws for drinking cold beverage, sipping cocktail, coffee, ice tea, cappuccino etc. Skip the plastic, have the real thing! When you pull out the healthy metal straws and flatware, you will help people move toward a minimal waste lifestyle. Let’s save our earth and environment. Made of 304 ASTM standard food used stainless steel, durable and reusable cutlery sets for travel or camping. Cutlery kept clean and compactly stored in stylish, washable neoprene case. Dimensions: fork-6.77”, spoon-6.77″, knife-6.97″, chopsticks-7.28″, straw-8.46″, brush-8.46″. Lightweight and portable utensils for everyone. Only 108g(3.82oz), pack with a neoprene case great for travelers and carrying in your bag or backpack.